African Poetry: Vanity by Birago Diop Summary, Setting, Author's Background, Themes, Language and Style for JAMB, WAEC and NECO Literature Students 2016 - 2020 Syllabus. It is no longer news that the above selected poetry is among the selected texts for literature students in the WAEC, NECO and JAMB Syllabus for 2016 - 2020. Well we have decided to help students by providing some insights such as summary and poetic devices and analysis of the poem to aid them understand and prepare ahead of their examination. Birago Diop (11 December 1906 — 25 November 1989) was a Senegalese poet and storyteller whose work restored general interest in African folktales and promoted him to one of the most outstanding African francophone writers. A renowned veterinarian, diplomat and leading voice of the Negritude literary movement, Diop exemplified the "African renaissance man, Introduction of Western culture and values which follows the colonization of Africa; majority of Africans especially those that received the influence of Western education, deliberately separated themselves from the traditional beliefs, practices and general ways of life of their people. As a result, they perceived these beliefs and conventions as their white masters would. They perceived them as primitive, retrogressive and obsolete. In the French West Africa, which happens to be the origin/region of birth of the poet, the Assimilation policy introduced as a system of administration by the imperial France actually set out to achieve this, in the name of making Frenchmen out of the natives and granting them equality, liberty and fostering fraternity among all. It should be noted that Africans who later travelled or went to school in France discovered the contrary, they were deceived, their white masters caught in, on their ignorance. So they later realized the fact that African values and ways of life are not inferior, and this is what provided the background to the poem. 5 Who indeed will hear them without laughter? What eyes will watch our large mouths? 10 What eyes will watch our large mouths? What heart will listen to our clamouring? 14 In the black depth of our plaintive throats? 24 In the air, on the water, where they have traced their signs. 30 What ear to our sobbing hearts? The setting of the poem is Africa, though we may attempt to narrow it down to French West Africa or Senegal, the capital of French colonies in the sub-region,this was where many false French citizens had been carved out of Africans. It should be noted that the temporal setting is the pre-independence period. During this period, most of the educated African elites were eager to become French citizens and partake of the benefits that were associated with it. During this era, there was an aberrant desire for white values and civilization, as well as deliberate attempt to degrade African values and look down on the very few people who upheld these values among the new educated elites. The writer of the poem is bittered with the way Africans subtly neglect their roots, and A abandon the conventions and teachings of their ancestors. In addition, there is a preoccupation in the need to look inward in the efforts to solve the challenges faced by the continent. The poet advises that turning ears or eyes in other directions will not help the situation on ground. Therefore, he warns that this trend be ameliorated, lest Africans stand the risk of becoming objects of derison. 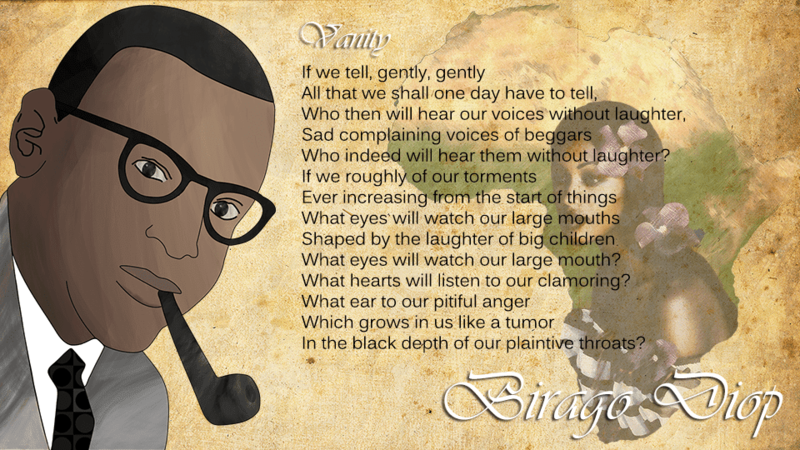 In this stanza of the poem, the poet expresses that Africans are reluctant to address an issue of serious concern. He comments that we are not making use of a protesting tone to tackle the situation. However, it is a situation which should not only be addressed openly but loudly too. As a result, any delay will make us object of derision. The poet stresses further that we should not make any complaints as a result of our current situation as this will not make us any better than 'sad complaining voices of beggars'. The poet uses this expression, 'sad complaining voices of beggars, which is a paradox to mock our situation as beggars are not expected to complain. In this stanza, the poet expresses that it is pointless to start complaining while we abandon the proper course of action. The stanza expresses how the poet continues to wonder that who will listen to us, who will give use their attention, if we complain about our pains, which did not come yesterday but have been there for ages. So this stanza is still emphasizing the fact that we have not addressed our challenges the right way. In this stanza, the poet stylishly reiterates the first two stanzas of the poem. The poet uses the language of rhetorical question to ask that if we begin to complain and get angry, that who will listen to us. He calls such anger a growing tumor. Note that tumor is usually a self-inflicted structure. Therefore, in this stanza of the poem, the poet points out that we should not complain about the present situation as it is unjustifiable because we are suffering from a self-nurtured pain. This stanza is the longest in the poem. In this stanza, we have the full detail of why the poet asks if there is anyone who will hearken to our cry, or why we should not be mocked. The writer makes us to understand that our ancestors come like spirits to give us advice and plead with us on certain course of action but we turn deaf ears. Therefore, the writer describes us as "blind, deaf and unworthy sons". This stanza of the poem tries to take us back to all that has been said in the previous stanzas. The poet opines firmly that we are not being given attention if we now complain or murmur as we have also turned deaf ears to the counsel of elders.